Felini (#7) was installed as the morning-line favorite, but I’m starting to wonder how talented she really is. Her lopsided maiden victory came against a pitiful field, and it’s hard to find excuses for her poor showing against winners last time. Given a short price on her, I’m interested in others. While Felini possesses tactical speed, I’m not sure that she’s quite as fast as Atlantis Romance in the early going. In fact, the TimeformUS Pace Projector is predicting that this filly will be on the lead in a situation favoring the front-runner. ATLANTIS ROMANCE (#3) lost in her prior start at Aqueduct in February, but that came against a stronger field when she was part of a contested pace that was falling apart late. She followed that up with a good third at Parx Racing behind the talented So You Know, earning the highest last-out TimeformUS Speed Figure in the field. Her overall record appears to be somewhat inconsistent, but a closer examination reveals that she’s just encountered unfavorable scenarios from time to time. 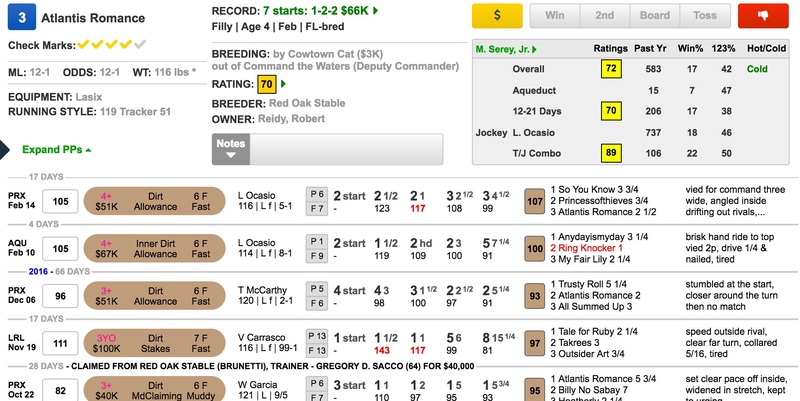 For instance, what chance did she have back on Nov. 19 against stakes performers Tale for Ruby and Takrees in a race that completely fell apart late. This filly is in the best form of her career and would offer great value at anything close to her 12-1 morning line. I’ll use her with the aforementioned Felini, as well as late-runners Ma Can Do It, Bombshell, and Ring Knocker.